Portland, Oregon, is known for being ahead of the curve when it comes to alternative housing and co-operative living. 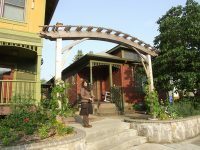 From the Tiny House Hotel to the Columbia Ecovillage cohousing community, there are dozens of locations in the city where you can see these innovative projects in action. The company was founded by Eli Spevak, who has years of experience working for Habitat for Humanity and volunteering with Dignity Village, a tiny house homeless encampment in Portland. 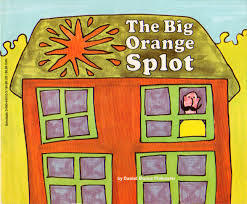 He named the company after the children’s book The Big Orange Splot, in which a painting accident inspires a community to get creative with the color and character of their houses. The homes were built using salvaged lumber and windows, and some of the structures include solar panels and green roofs. Residents share garden spaces, fruit trees, and some chores, and split utility costs among all four houses. While cohousing is still out of the price range of many Portlanders, Spevak believes that higher-density projects like these are key to long-term affordability. In a post called “Plank of Progressive Planning Ideas for Portland That Won’t Piss Off The Neighbors,” he advocates for legalizing tiny homes and ADUs, building pocket neighborhoods, and creating inclusionary zoning. He also calls for “remov[ing] the definition of ‘household’ from the zoning code to open up spare rooms for occupancy in larger homes. This would legalize ‘co-living‘ and other innovative, community-oriented housing models being pioneered in the Bay Area.” If more developers experiment with projects like these, we can expect Portland to be a major player in the cohousing movement for years to come. Learn more about Orange Splot LLC on its website and see more photos of Sabin Green here.